These are all photos either from my yard or our walk on the local fire road. I have been enjoying the Hummingbirds and lots of Goldfinches. On our fire road walk we have been seeing and hearing lots of Ovenbirds, Scarlet Tanagers and Wood Thrushes. On this day we saw a Summer Tanager. One morning I was on my deck and heard the Great Blue Herons going nuts, around 10 of them took off and flying circles around a juvenile Bald Eagle. The Summer Tanager seen off the local fire road. The Summer Tanager flew from one side of the fire to the other side. It is the same bird as in the photo of above just a different tree. I think this is the American Toad. If not please let me know. I almost stepped on this toad sitting right in the middle of fire road. Wonderful photos. I love the Anerican Toad. I think toads are so pretty. Happy Weekend! The Herons circling the Bald Eagle is an extraordinary event and the photo tells a lot. The Tanager is a beautiful, bright colored bird, which I don't think I have ever seen before. Mr. Hummer in the first photo is also very lovely. Beautiful birds, those colours are so lovely,sorry about the toad, I would give him a very wide step aside. Maybe he would be somewhere near the bottom of my fav lists. a wonderful range of critters. It must be hard o be a raptor with all other bird going nuts :) Always love to see the hummers. Hello, the Tanager is again something new for me. Have a good weekend and thanks for hosting! Good Morning, Eileen. Very pretty pics this morning. I hope you will have an enjoyable weekend. Beautiful pictures of the birds and the frog. All photos are beautiful and perfectly sharp. I enjoy your Saturday varieties . . . I do think a Tannager has been visiting here . . .
Makes me happy . . .
Nice shits of the Summer Tanager, a species that we rarely see here and then generally only in the southernmost part of the province. Hi Eileen, Thank you for hosting. It is always lovely to see your little birds, although I think I might squeal if I stood on a toad! Fabulous bird photos. It must have been quite the experience to see the heron going wild in the sky. Have a great weekend Eileen. ...the Summer Tanager is the bright spot! Enjoy your week. São de uma grande beleza estas fotografias. Great photos. I would love to see a tanager! Happy weekend to you. Lovely 'feathered friends' photography and of the toad too! The Tanager is such a perfect color...a summertime color! And how neat to see those herons with the eagle. Nature at it's best...WILD!!! Enjoy your weekend! A fine collection of birds and an unexpected toad, Eileen! Mr. Toad was hiding in plain sight. Love the summer tanager. I saw goldfinches in the winter, but haven't seen any since the weather warmed up. And the hummer. They are so much fun to watch! Have a wonderful weekend. PS: Have a great new week! Eileen, nice variety, especially the Great Blue Herons in flight. Thanks for sharing. Hi Eileen. Wow, I like that Summer Tanager with those lovely looks and matching name. Nice to see your Goldfinch still around. Our own Goldfinch are in the garden 12 months at a time, now the most common garden bird. Thanks for the link-up today and have a lovely week ahead. The tanager is such a pretty bird! the tiny birds are so cute and that tanager is just amazing to see. I have never seen one in real life. The tanager is so handsome, I would like to see one of those. What fun birds to have nearby. Now the great blue herons and bald eagle must have been a very strange conflict. They have very different flying patterns. It would have been interesting to watch. Beautiful photos! Love the Summer Tanager! oh that summer tanger, what a treat!! we appreciate you eileen, for bringing us all together!!! A rare moment when a hummingbird isn't flying, I see! I love that Summer Tanager. Have a great weekend! Eileen, the Tanager certainly brightened up my day. Ah..gasp...that red Tanager is so beautiful! Hi Eileen, I enjoyed all these photos. I think you have seen my posts about the eagles in my neighborhood. What fascinates me is the way sometimes very little birds will torment the eagles as they are flying around here. I guess the little ones figure the eagle can’t be flexible enough to flip around, grab them, and take them to the ground. Now, the Great Blue Herons are probably as big or bigger than the eagle, but again, they would be little match for the eagle’s talons and their powerful wings. Fascinating stuff! Neat post, thank you for sharing. Hope you have a happy weekend. 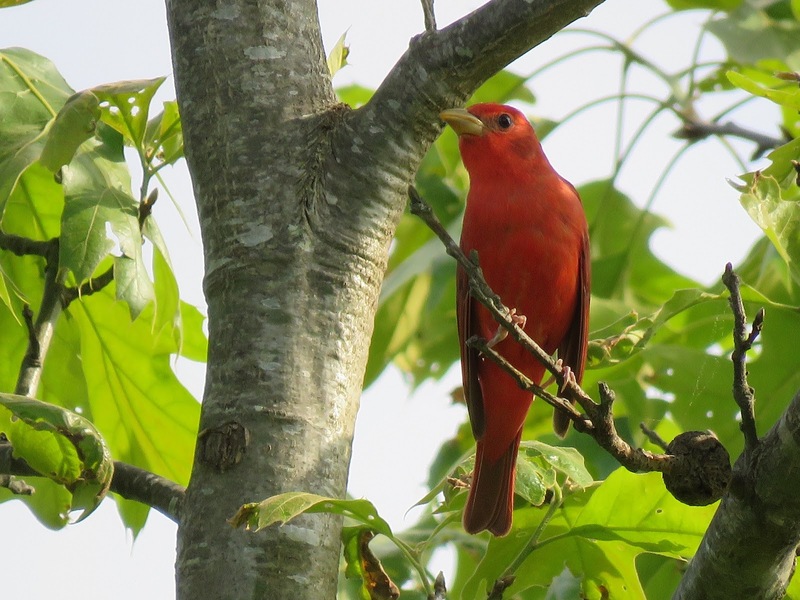 Amazing photos, I especially loved the shots of Summer Tanager. Great shots! I especially love the hummingbird. Your friendly visitors are awesome.. I would swoon if I saw a red tanager! Nice to see the tanager. I haven't ever seen one but maybe I will get lucky. Sweet hummer, I'm going to read up on diff between male and female. Thanks for hosting this party. That must have been amazing to see all of those herons flying around the eagle, Eileen! Love the Summer tanager, and I should be seeing some at home. Glad you noticed the frog and didn't step on it! Very nice ! I love the hummingbird ! I have never YET been able to capture a hummingbird even though they visited often in years past. Wonderful pictures, Eileen..Love the Hummingbird shot..good catch..I see one every day or so..Impossible to be there at the right time..Hope you are having a good weekend..Thanks for hosting..
That must have been cool to see so many herons flying around. The tanager sure is pretty. I'm just not ready to post. Tons of photos from our trip. I love your birdies! Oh the pretty summer birds - and those herons with the eagle - I've never seen anything like that - amazing - and then to have captured it. Happy week ahead. Lovely capture on birds and summer tanager is pretty in red and I enjoyed the second one of the bird in green background. Love all the photos! I bet it was something to see all those Herons. I bet that WAS a ruckus with the herons & eagle! Great series Eileen. Thanks for linking in this weekend. Wonderful photos Eileen, lovely collection. Happy week coming up. Another wonderful selection here Eileen, thank you. I love the colour of The Summer Tanager, just lovely. I hope your weekend has been good, my best wishes for the new week to come. Thank you for hosting this, Eileen! I'm a day late, I hope it's still all right to link up. I've never seen the scarlet tanager. Glorious! What I wouldn't give to get such a close-up of a tanager! We have seen the Western Tanager here a couple of times, but never in a position to get a good picture! The tanager has beautiful colour.